UNESCO and the International Union of Architects (UIA) are launching an initiative to associate UNESCO with the designation of the host cities of the UIA World Congress as World Capitals of Architecture. 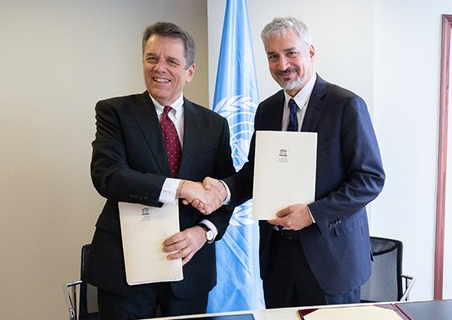 UNESCO's Assistant Director-General for Culture, Ernesto Ottone R., and UIA President Thomas Vonier signed a Memorandum of Understanding in Paris on 23 November 2018 to strengthen cooperation between the two organizations, which dates back to 1956. "UNESCO's association with the UIA's World Capital of Architecture initiative marks a new step in our long-standing partnership. The aim is to create new synergies between culture and architecture in an increasingly urban world, in which cities are hubs for ideas, trade, culture, science and social development in particular. Through this initiative, our ambition is to ensure that these cities are also perceived as open and creative spaces for exchange, invention and innovation," said Ernesto Ottone R.